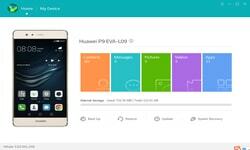 Huawei recently released Huawei Hisuite latest free download for windows. This latest Hisuite is updated with new and powerful features. This Huawei HiSuite creating a secure connection between your phone and Windows PC system. Huawei HiSuite allows you to manage music, reading and sending SMS messages directly from your PC screen and installing/uninstalling APK apps from your device. This HiSuite also synchronization of contacts and contact details, backing up data saved on your phone like photos, music, videos much more. Easily manage your data and applications. One-click download and installation from the internet. Enhanced Android smart device user experience. Easy connections to your Huawei phone. Management of your data on devices. Update your device system in few clicks. Clear interface for Huawei users. Download HI suite from the given link. Wait for few seconds to download the file. Installation window will appear and proceed the process by clicking next. Congrats, Hisuite is installed in PC Windows. Enjoy latest features of Huawei Hi PC Suite. Huawei HiSuite allows you to update your smartphone and tablets directly from your computer. You don't have to download any package to your service Separately. HiSuite automatically detects the available update for your device and allows you to install it from your computer. If you are looking for an easy way to connect Huawei device to your computer for transferring data and files, then connect download and install latest HiSuite for your PC Windows. After download and install the HiSuite latest version you can easily manage Huawei smartphones and tablets easily without the use of any other mobile tool or software. Huawei suite software support all Windows 10, 8, 8.1, 7, Vista and XP on either a 32-bit or 64-bit setup. So just click the given link for Huawei Hisuite free download.